I’m sure, if you are a football fan, or simply follow sports, you are aware there is currently a lockout affecting the very integrity of our beloved national gridiron past time, the NFL. The complaints are legitimate and anyone who has watched a game in the preseason or in weeks one or two of this season, has noticed the difference between the usual officials and these replacement scabs. There have been a multitude of blown calls and numerous examples of these refs clearly not understanding the rules. This is more than just a sports issue. This is, once again, a labor issue where big business owners are flexing their muscle in favor of profit over quality. To sacrifice quality in this case actually impacts the livelihood of the officials, the integrity of the game and most importantly, the safety of the players. Time will tell if this plot to save such a minuscule amount at the expense of the players, officials and fans will pay off, but the evidence is strongly against this irresponsible conduct by the owners and the commissioner’s office. It almost seems like a plot designed by the Koch Brothers and Governor Walker. This isn’t a strike. It’s a lockout. The owners are trying to teach the officials a lesson. For a league with revenues far north of $8 billion a year, the petty cash in dispute is laughable. Especially when you consider there are only 119 NFL officials. And that they’re employed part time. For a sum of $50 million a year – less than 1 percent of total revenue – the league could hire 200 well-trained full-time officials at $250,000 each. Since the harsh sanctions were brought down upon the coaching staff of the New Orleans Saints for the bounty program, some may think Roger Goodell is a man of integrity. He appeared to be a commissioner who has gone to great lengths to punish those participants and hand out fines en masse, all in the name of “player safety.” On August 31, Goodell issued this statement: Part of our responsibility in helping teams and players prepare for each NFL season is to make sure they understand and respect league policies and rules. As always, we hold everyone, including ourselves, strictly accountable for protecting the integrity of the game […] We will aggressively protect the health, safety and long-term livelihood of our players, both on the field and off. However, the NFL grows more dangerous by the week thanks to his decision to play hardball over one percent of league revenue and lock out the officials in favor of scab refs. Deadspin, for one, assembled a compilation earlier this week of what it deemed “the 21 worst replacement referee mistakes from Sunday,” filed under the tag “Scabwatch.” However, Goodell and many of the sportscasters have been trying to gloss over this issue by simply not mentioning the performance of these far less experienced officials. So why are we in this predicament? As always, because of money. The league has offered what it says amounts to a 5 to 11 percent increase in salaries while the National Football League Referees Association says that increase would effectively be only 2.8%. 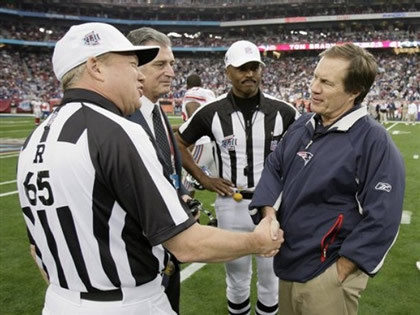 It is true that NFL officials are paid much less than their counterparts in other sports. After five years, an NFL official makes $42,000. Meanwhile, a fifth-year MLB official makes $141,000 and a fifth-year NBA official makes $128,000. The choice of using anything less than the most competent referees is prudent at a time when the league is being sued by more than 3,000 former players. These players contend that the league was, at best, negligent in educating them about the long-term health effects of playing football and, at worst, concealed evidence of these effects. By putting less competent officials out there now, is the NFL adding to the case against itself? It sure doesn’t seem like the owners are too concerned with player safety. This obstinate behavior demonstrates how labor must bow down to the owners’ whims, at whatever cost. It seems this is a pattern all too familiar ever since the PATCO strike in 1981. Unfortunately, this is the gamble that Goodell took when he decided to start the season with truly low-level replacements. He could have ended this lockout weeks ago for roughly the amount of money that NFL executives spend on dry cleaning every year. Goodell played to win. The real refs gambled, too. They bet on their own ability. They gambled that we would notice the difference. We certainly have. We want them back and we think unions are a good thing for this country, even on the football field. This strike, like the teachers’ strike in Chicago, is the last bastion of hope for organized labor in America. If these folks fail in their quest to insure quality working conditions, pensions and other basic workers’ rights, we will become a nation like China where human labor is treated like a commodity. I suppose that will suit the owners just fine. After all, most NFL owners favor the Republican Party. We all know where the GOP stands when it comes to workers’ rights.